PORT OF SPAIN, Sep 18 2013 (IPS) - Dianne Christian Simmons recalls the days when she would head out with her husband on fishing expeditions in the Gulf of Paria, a 3,000-square-mile shallow inland sea between Trinidad and Tobago and the east coast of Venezuela. Gary Aboud, an environmental activist and secretary of a local group called the Fishermen and Friends of the Sea (FFOS), blames the industrial shrimp trawlers, which he says use methods banned in many countries, for creating “deserts” in Trinidad and Tobago’s territorial waters. Aboud said that as far back as 1996, the U.S.-based World Resources Institute was warning that shrimp trawling was comparable to dynamite fishing in terms of sustainability. “In other words, shrimp trawling kills everything. Shrimp trawling is the most destructive and unsustainable type of fishing in the world,” he told IPS, applauding the decision earlier this month by the government to ban trawling in local waters. Minister of Food Production Devant Maharaj, worried at the declining seafood stocks and the environmental damage associated with shrimp trawling, said the government is considering an amendment of the Fisheries Act to give teeth to the new measures. He said a committee would be appointed to consider a “relief package” for displaced fishers who will be affected by the ban. Late last year, the president of the Trinidad and Tobago Trawlers Association, Shaffi Mohammed, said his members were prepared to call it quits if the government came up with an adequate compensation package. The group, which has vigorously protested the ban, now has until Oct. 26 to submit a proposal on sustainable fisheries management to the government. Christian Simmons believes the estimated 5,000 people working in the industry must accept the necessity of halting the outdated mode of catching shrimp. “We are not saying to stop catching shrimp, we are saying to change your method. 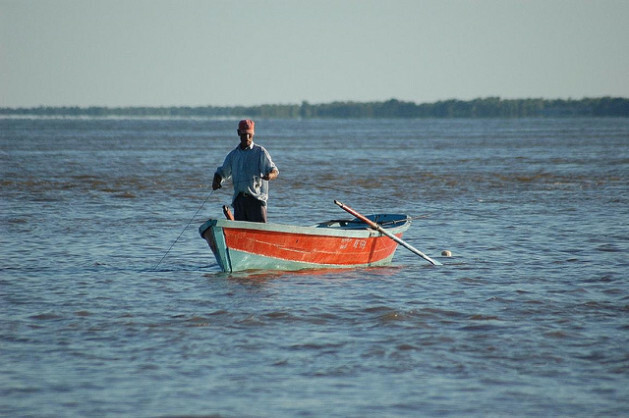 There are other more sustainable methods of catching shrimp,” she added. Trawling involves the manual or mechanised towing of a “trawl net” through the water or along the sea bed. Nets vary in size but can span tens of feet and run behind the boat for miles (drift nets), indiscriminately dredging the water and sea bed. “This state of affairs has resulted in serious conflicts amongst competing fishers and has also been used by environmentalists as compelling justification for immediate and strong action to be taken to address trawling activities,” Maharaj said. Aboud told IPS the nets attached to the industrialised trawlers are heavily weighed down and dig deep into the seabed, capturing everything. “The depth they are fishing at and the fact that they are such large and powerful vessels, they cover an area the size of 50 football fields in a day. That is a lot of desert they are creating so the destruction is immense,” he added. He said the nets also capture minnows and juvenile fish, resulting in a drastic reduction in the fish population. Studies have shown that Trinidad and Tobago has the highest rate of discard of babies caught compared to any other part of the world, he added. “We have 14.73 pounds of babies caught and discarded for every one pound of shrimp,” Aboud said, adding that sea grass, which provides shelter and food for small fish, is also destroyed. The practice has been banned or restricted in several countries, including Australia, Brazil, Canada and Malaysia. Aboud believes that an environmentally friendly way of catching shrimp without disturbing the environment would be the use of shrimp pots, small traps that resemble wire cages. The president of the Trinidad and Tobago Unified Fisher-folk (TTUF), Peter Glodon, sent a letter to Maharaj stressing that the 52,000 artisanal fishers of the twin-island state welcomed the crackdown on shrimp trawling, which has “completely destroyed the ‘battalie’ species of turtles in the Columbus Channel and many more species are on the brink of extinction”. But he said that the ban should not be only for industrial trawlers, but should cover the “semi-industrial and the artisanal fleet that indulge in shrimp trawling”. “By not doing so you will hasten the collapse of the fishing industry. Whether big medium or small, they all contribute to the mauling of juveniles,” he wrote.